-Seen It- A family of five navigate their life together in utter silence, hiding from horrifying creatures that hunt by sound. The father (Krasinski, ‘The Office’) is a survivalist who focuses on getting his family through each day. While the mother (Blunt) tries to ensure their children be fully-formed people… Krasinski (who also directs) and Blunt are married with two kids in real life, and this is the first time they’ve shared the screen. They bring that chemistry with them. It’s intended as a metaphor for the anxiety of parenthood (most good horror has a metaphor in there somewhere) and there’s a heightened intensity to their performances (notably the birth scene). The silence concept is (consciously or otherwise) an expansion of ‘Don’t Breathe’, with the original screenplay containing only one line of dialogue. The sound design is terrific, as is the pounding soundtrack. It all makes for an unusual and edge-of-the-seat experience with genuine jumps, though towards the end it’s somewhat stuck on a repeat cycle pattern, and has an overly signposted resolution straight from another alien invasion movie. 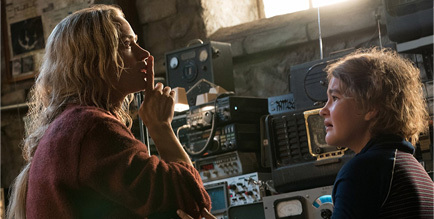 ‘A Quiet Place’ is the biggest horror box office smash of 2018, taking in $188 million in the US, and $152m internationally – $340m total from a $17m budget. A sequel is in the works. N.B. Also features the most irresponsible pregnancy of the year. 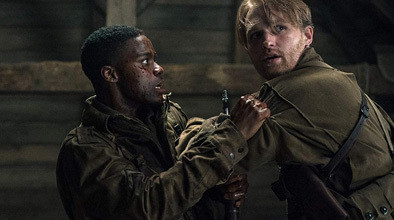 -Seen It- In 1944 a division of paratroopers, including a new private (Adepo, ‘Fences’) and a corporal with explosives expertise (Russell, ’22 Jump Street’), is tasked with dropping behind Nazi lines and detonating a communications tower in an occupied French village. But after a disastrous jump the survivors find themselves pinned in the house of a local woman (Ollivier) and discover that beneath the tower are horrific human experiments, to create soldiers for the “1000 year Reich”… ‘Overlord’ lifts a lot from the Wolfenstein game series (particularly 2001’s ‘Return to Castle Wolfenstein’), from concept to aesthetic, but damn if it isn’t a great Wolfenstein movie. Indeed without the horror, this would actually be a very good war film (it’s about 30 minutes before anything fantastical emerges). It has the scale, palpable sense of danger, camaraderie, satisfying/brutal gunplay, etc. The opening plane drop is the most intense aerial sequence I’ve seen in a war film and tension remains near constant to the end. When the mutated soldiers eventually emerge the fx are disturbing and effective because they don’t get too carried away – there’s no hulking monster climbing on the ceilings. The science behind the experiments is never explained, but that’s for the better. Also despite it being about Nazi experiments, the story doesn’t get the cast stuck in the lab and tunnels. These are all smart decisions. It’s a J.J. Abrams production but the rumoured Cloverfield connection does not appear, thank goodness. The protagonists are probably the noisiest, shout-iest infiltrators of all time, but there you go. Genre fans have the added entertainment value of watching Wyatt (son of Kurt) Russell knowingly follow his father’s footsteps into gory horror. He increasingly channels his father’s ‘Thing’ performance as it moves into the final act, even stopping for a re-delivery of its most famous line. In summary, there isn’t a better horror film set during World War Two. -Seen It- 40 years on from the babysitter murders, two true-crime podcasters visit a now 60-something Michael Myers in his mental institution, presenting his mask in an effort to get him to speak. 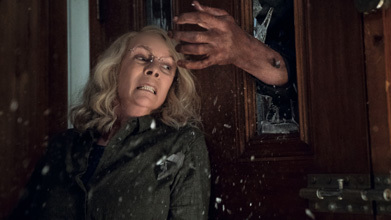 Meanwhile Laurie Strode (Curtis) is a longtime PTSD sufferer whose obsessive prepping for a Michael escape has caused a rift with her married daughter (Greer, ‘Ant-Man’). Her granddaughter (newcomer Matichak) still keeps in touch as she readies for Halloween with her teen friends. But when Myers escapes during a prisoner transfer he goes on the rampage, pursued by a veteran cop (Patton, ‘Armageddon’) and his psychiatrist (Bilginer, ‘Ben-Hur’), drawing closer to a showdown with the well-armed Laurie… Following the dire Rob Zombie Halloween films, Blumhouse bought the rights from Dimension with John Carpenter’s involvement (his first participation since ‘Halloween III’). David Gordon Green and Danny McBride, who were already fans, proposed their (straight horror) vision to Blumhouse and Carpenter. The film erases all previous sequels, cancels Laurie being Michael’s sister, has Carpenter write an updated soundtrack with his son, and brings Nick Castle back to portray Myers. The result is a studied, intelligent sequel, easily the best since the original. It’s been a hit with critics (79% RT) and audiences, making a staggering $230 million worldwide from a $10m budget. However as someone who has followed the series I can’t say it was particularly frightening, at best it raised anxiety hoping certain characters would survive. This is due to an over-familiarity with the monster and because Michael (despite saying nothing and his face being all but hidden), is humanised by the intrinsic frailty of his elderly age, coupled with a lack of impactful winking at anything supernatural. Add to that the Shape’s inability to get anywhere quickly (with the locations very spread out this time) which means he get shot just trying to walk slowly out a house, and effortlessly run-over walking down the street on his way to the next target. With a well-armed Laurie (channelling Sarah Connor and Kevin McCallister), her well-trained daughter, plucky granddaughter, and cops on his tail it feels like the odds are stacked against him (the state already took his 40 best killing years). Other issues include the Myers-proof house being illogically dangerous, and the too-abrupt ending. That said there is far more to enjoy. The atmosphere, nostalgia, and faithfulness to source are terrific. The three generational Strode relationship is nicely setup and having three protagonists makes the outcome less clear, feeding into the film’s unpredictable story flow (within an overall predictable framework). The characters are well drawn throughout regardless of screentime, with Laurie’s heartbreaking portrayal in the first half the standout. ‘Halloween’ (2018) is a special event for all longtime horror fans. John Carpenter’s new synth score is terrific (especially as a solo listen) and his close production involvement marks this as (probably) the swan-song for one of the horror greats. -Seen It- After her sinister, distant mother passes away, an artist (Collette, ‘Krampus’) must come to terms with the grief. Backed by her supportive husband (Byrne, ‘End of Days’), she looks out for her weed-smoking son (Wolff, ‘Death Note’) and strange daughter. But grandma’s presence lingers and it seems she set something awful in motion. 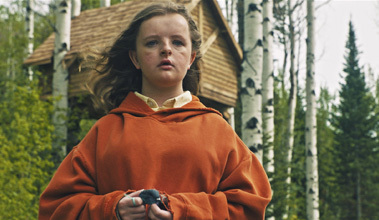 Further tragedy will push them all to breaking point and sink them deep into a cursed nightmare… Easily the scariest film of the year, ‘Hereditary’ unnerves from the first frame and has the cold, sharp intelligence behind the camera which the best horrors have. If Kubrick has continued to work in the genre after ‘The Shining’, this might have been one of his. The acting is excellent across the board, with Collette deserving of an Oscar nom. Tragedy at the end of the first act turns the film into a bleak (but brilliant) bereavement drama for quite a while, the straight up terrifying score subsides and it feels like it’s lost its way as a chiller. But this is temporary and all part of the design. Whenever it decides to scare it’s masterful. Overused horror tropes like seance and possession are here, but the fact it can make these feel truly chilling again is a testimony. By the end ‘Hereditary’ has hit the right balance of mystery and explanation. And Toni Collette in the final scenes is the stuff of brain-searing nightmares. Please Like and Share. Let me know your favourite horrors of the year in the comments. There are some good ones on here. I don’t know about the Suspiria remake. On the one hand the teaser trailer is quite good. On the other, it isn’t really a story. So much of it is the visuals and sound, that it seems odd to look at it as any kind narrative fiction. The remake sort of comes across like the Herzog version of Nosferatu. It’s very classy but it simply isn’t Nosferatu, which taken as a story is just Dracula anyway. The actual narrative part of Suspiria is pretty much like any number of kids books where a girl finds out her teachers are witches or maybe the Demon Headmaster or something like that. Some films are just exist in their final form as what they are rather than as stories to be retold. I wrote this before the teaser trailer was released and was very impressed by the footage, matched my high expectations. Narratively it doesn’t say much but it is only the teaser and horror narratives often just set up a thin premise and then leave the rest to visual mood and suspense (eg Halloween). For me the trailer captures that unsettling dream-like quality of Argento at his best. There’s also something just so creepy about the ’70s aesthetic for horror, starting with the wallpapers. Which ones on here are you anticipating the most, or are there any I didn’t include? I’ve seen Some of them and liked. Looking foreword to Ghost Stories, Heredity, Slice, House that Jack Built, Extremely Wicked and Suspiria, which I think will be good, but it just isn’t Suspiria. The point to me is that you can remake anything, but if you remade say Eraserhead it would not be Eraserhead because it’s not primarily a story in the first place. Suspiria to me is the same kind of thing. It’s too much about authorship and too tied to an aesthetic that only really exists as the 1977 film. From what I gather the director of the new one doesn’t think of it as a remake, but more as separate film with the same title. Really it’s about name recognition being used to green-light an intriguing project. Less interested in things like The Nun. Most of them I will watch. I’m a horror nut. The one I’m most doubtful of is Halloween. I love slasher films, but I tend to like the knock-offs more than the sequels. So I’d rather watch a film a bit like Halloween with a masked killer and a different title than another Halloween sequel. But I will absolutely watch the sequels anyway.They’re a bit like nature-run-amok or monster movies, generally, in that respect. Just having a new beast or new killer refreshes the formula. For me this Halloween is the last hoorah for John Carpenter (it seems he is fairly closely involved), my favourite horror director. It’s just an essential event, one that’s making all the right noises (pre-trailer). Though it will be a major challenge to instill fear again after 40 years of the Myers mask in pop culture. Susperia sounds like a genuine passion project from a filmmaker of a superior intellect. If it ends up feeling like its own thing, I’m totally fine with that. Having seen the trailer for Halloween, it looks better than I expected. Seems it’s practically a remake, but it has captured the vibe of the first film very well. Is Myers still scary? Jury’s out on that. Hereditary will almost certainly be the better/more terrifying film, but can’t wait to see it. I watched Suspiria in LA this past weekend and I ABSOLUTELY LOVED IT! It’s top of my list of 2018 horror films (and in all time along with the original). I’m so glad they didn’t copy and paste like Other remakes. This version is definitely more grim and evil. Both are great. Don’t compare. Just love both! You could tell Luca Guadagnino put his heart and soul into this film and it shows. He’s been wanting to make Suspiria since he was a kid. Bravo on a great retelling Luca! Go see it everyone! Don’t believe the bad reviews calling it the next “Mother!”. the Ritual i wasnt very encouraged to watch cause of the mixed reviews it received, but in the end its bloody brilliant, the monster that appears is something else. Mandy – best horror movie of 2018 so far. I can imagine Jason Statham having a drink with the shark at the end of a day’s filming. Whole thing just piss take of Jaws with no crimson goo. The 2018 horror movies I would recommend are A Quiet Place & Pyewacket. nothing is as frightning as what you can’t see just sense.. I encourage you to read my synopsis of ‘The Predator’. Every year there’s a commenter like this. The question is: what are your top 10? That’s when it normally falls apart, if they reply. I wouldn’t class ‘Incident In A Ghost Land’, ‘Cargo’, ‘Summer Of 84’, ‘Annihilation’, ‘Mandy’, ‘Overlord’ or numerous others here as ghost/evil/possession stories. But, sigh, some folk just like mouthing off.